For over 30 years we have handcrafted Woodwarm stoves in the heart of the Devon countryside. a range of wood burning and multifuel stoves that combine state of the art efficiency with reduced pollution to create really environmentally friendly stoves. Woodwarm stoves are constructed with steel and cast iron and have stainless steel fittings. Each one individually built by craftsmen and rigorously tested to ensure consistent quality. We are also passionate about design and detail and have created a range of innovative, contemporary and traditional stoves that will provide the focal point of any home. These modern, stylish, highly efficient stoves are the latest addition to our range. The Phoenix Range of multifuel stoves all feature the unique clean burn air wash system that keeps your glass clean at all times. All available with log store style base. They are all suitable for a 12mm super imposed hearth. The baby of the range, but with an output of 4kW, it still packs a punch.. The stove runs on a 127mm flue, full riddling grate, seperate ash pan for easy cleaning. Other features include interchangeable top and rear flue and a vertical rear flue adaptor as per the other freestanding stoves in the Phoenix Range. Please ask for boiller options. Shown here on an integral log store style base giving an overall height of 835mm. An ideal stove to fit in shallow fireplaces for less protrusion into the room. The Firegem is also approved for smoke controlled areas and runs on a 127mm flue. Fully approved for use in smoke controlled areas and runs on a 127mm flue. Available with integral log store style base. Please ask for boiler options. A new addition to the Phoenix Range. This larger 10kW model is available in standard height (shown above) or with an integral log store base. The Firebug 10kW runs on a 152mm flue. This versatile stove comes with boiler options ranging from 10,000 to 30,000 Btu’s. The Fireview multifuel range is designed to meet all your heating needs, with outputs ranging from 5kW up to 20kW to heat any size of room. Woodwarm Fireview stoves epitomise the design detail of an efficient air washed clean burning stove. Incorporating overnight burning, they are easy to light and use. 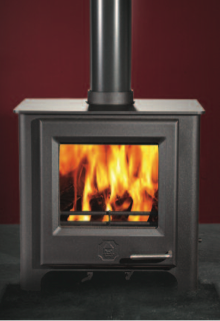 The Fireview 6kW with its range of canopy options is a very popular stove in the Fireview range. Available with a profiled flat top, flat top, low canopy or high canopy. The Fireview 6kW has an amazing all fire view of the complete firebox. A distinguished stove for any style of fireplace (shown here with low curved canopy). The original Fireview stove (shown here with flat top). The 9kW has a larger firebox and still retains the unique Woodwarm cleanburn air wash system. As on all the Fireview stoves the fully riddling grate allows easy ash removal from the ash box area. As with all the Fireview Range this stove is available with straight sides if required. 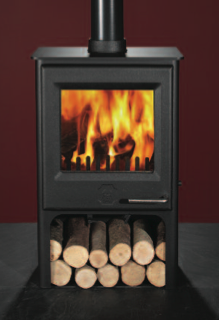 The elegantly proportioned Fireview 12kW has a larger firebox still, capable of taking 483mm logs. (Shown here with high canopy and optional brass fittings). With exactly the same proportions as the multifuel Fireview 12kW, but fitted with a larger door the 12kW PLUS offers you a full view of the firebox. All canopy options available as the Fireview 12kW. Please note a 177mm flue is required for this stove. The Fireview 16kW with its larger castings is a grand stove enabling you to burn logs up to 588mm long. It is available as either a Profiled Flat Top (shown here), Flat Top or Low curved Canopy. The largest stove in our Fireview range, it provides a huge firebox, taking a 635mm log. It offers the same canopy options as the 16kW. A Fireview stove with a door on both sides for a fantastic view of the fire from either side, still incorporating all the features of the single sided Fireview including the Woodwarm air wash system and full riddling grate. The Fireview 6kW is available in either single depth or double depth versions. Integral log store style base available on request. A very popular stove, a real focal point and a fantastic feature to any combination of rooms. This stove gives you a full view of the fire from both sides. (shown here on 100mm legs) 152mm flue outlet. Available with either a Profiled Flat Top, Flat Top or Low Canopy. The larger of our double sided stoves equivalent to two 6kw stoves back to back, the increased depth giving 12kw of heat. De-ashing, riddling and air wash control all available on both sides1. 52mm flue outlet . Also available with either a Profiled Flat Top, Flat Top or Low Canopy. Double depth 6kW with flat top and plinth. Log hopper shown is also available. The Woodwarm Wildwood range of stoves have been developed to be environmentally friendly, burning only wood as a totally sustainable fuel. This range is developed from the same body size as their Fireview compatriots and is capable of taking the boilers that fit the similar models. The Wildwood range of stoves are also available in sizes 7kW, 10kW PLUS, 12kW, 12kW PLUS, 14kW, 16kW and 20kW. A stunning centrepiece to any room, this stove is based on our 6kW Wildwood but with reduced depth. It takes a 152mm flue with the versatility of either the profiled flat top, flat top or low curved canopy - rear flue only on the low curved canopy (shown here with integral log store style base). Based on our excellent mid range stove, this Wildwood version is a very capable stove where both room heating and boiler options are needed. As on the Fireview stoves, a full range of canopies are available which allows you choice to blend with your decor (shown here with Fireview leg style base). This little 4kW stove has stunning 82% efficiency! The Foxfire not only benefits from the unique Woodwarm cleanburn air wash system, but also features new design details such as the stainless steel handle. The rear heatshield is fitted as standard and there are options of 50mm, 100m or 150mm legs or a 200mm plinth. The Foxfire is also available with an integral log store style base giving an overall height of 750mm (as pictured). There is a smoke approved area version of the Foxfire 4kw also available.